Santa Maria shares with Graciosa, Flores and Corvo the sad circumstance of being unknown to most Azoreans. And yet, "the island of Gonçalo Velho", the oldest of the archipelago and the first to be sighted (in 1427, at a time when the Azores were already a cartographic certainty), is extraordinarily beautiful and full of contrasts. From Dos Anjos to Maia, the island presents a very varied landscape, dividing into two distinct parts: a fairly rugged area to the northwest - parishes of Santa Bárbara and Santo Espírito - and a flatter one - Vila do Porto, São Pedro and Almagreira. An unusual nature, with steep ravines and deep valleys, Santa Maria are two on a single island in only 97 km2 of surface: one side is mountainous and covered with massive vegetation; The other is absolutely arid, known as the "red desert." In Barreiro da Faneca the lands are material of red clay and smell permanently of clay. Exuberant and extraordinary is the Bay of São Lourenço, with its white sand beach, and the imposing of its vineyards arranged in an amphitheater on the hillside, protected by basaltic stone corrals. In this beach resort I would like to have a house ... Not far from there is Maia, a nature reserve and also a place of summer, of charm and awe. 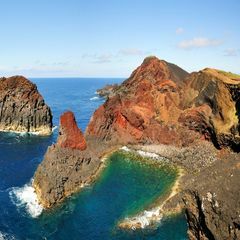 The Graciosa island, with 61 km2 and 4,390 inhabitants, is of all the islands of the Azores less mountainous and humid. “White Island” they called it, to what it is known to know due to the abundance of traquito, the rock that the distant one has given the impression of being white in the eyes of our first settlers. Hence the toponymy of the island: White Barro, White Rocks, Serra Branca. This island seduces the visitor by its landscape made of flat, rounded hills covered with trees, vineyards between black stone walls, fields of cultivation and the constant presence of the sea. The concept of untouched Nature applies here to a thousand wonders. Owning one of the richest ecosystems in the world, Graciosa is, since 2007, a Biosphere Reserve declared by UNESCO. If you want to travel to the center of the earth, do not stop by Jules Verne and visit the disturbing beauty of Furna do Enxofre, a rare and geologically unique volcanology phenomenon in the world. It is a depression existing in the basement of the Caldera - crater of an ancient volcano - where there is a phenomenon of liberation of sulfurous gases from a fluid mass in permanent boiling located in the innermost recess of the cave. It communicates with the exterior through two openings, and b in 1939, in the largest of them, was built by a simple master mason, under the guidance of Lieutenant Manuel Severo dos Reis, an imposing staircase (in a snail) of access, in masonry equipped , Now singled out as a happy example in terms of environmental engineering. For a long time, and before its construction, who wanted to know Furna had to descend tied by the waist. The naturalist Fouqué in 1873 and Prince Albert of Monaco, from 1879, were the first to study Furna, drawing the attention of the international scientific community to their interest and originality.